We’ve been extremely lucky. The LIGO and VIRGO detectors only operated simultaneously for a few weeks, but they were a remarkably busy few weeks. Today, those behind the joint collaboration announced that they’ve observed the merger of two neutron stars. And, because neutron stars don’t swallow everything they encounter, the gravitational waves were accompanied by photons, including an extended afterglow. So dozens of telescopes, and many in space, had representatives involved in the announcement. The number of major astrophysical issues cleared up by this collision is impressive. 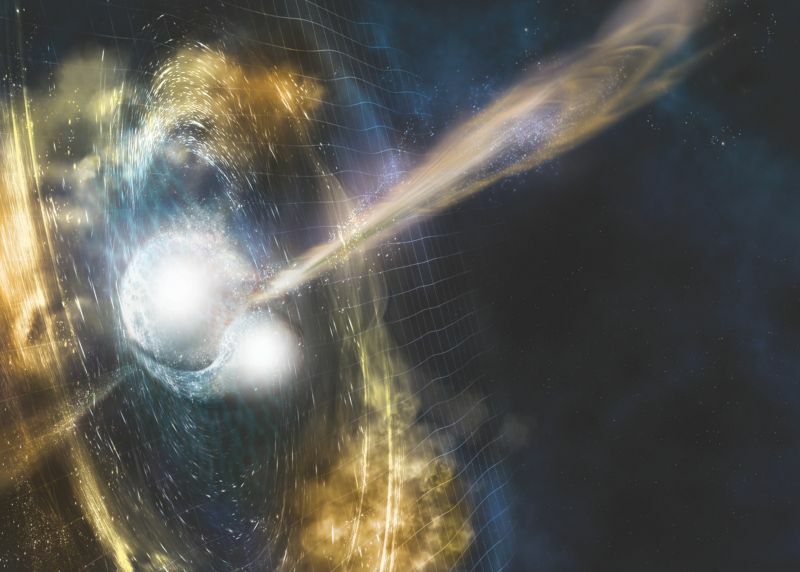 The collision was simultaneously detected with the Fermi space telescope, confirming that neutron star mergers produce a phenomenon known as a short gamma-ray burst. The gravitational waves were detected nearly simultaneously with the gamma ray burst, confirming that they move at the speed of light. And heavy elements like gold were detected in the debris, indicating that these mergers are a source of elements that would otherwise be difficult to produce in a supernova.